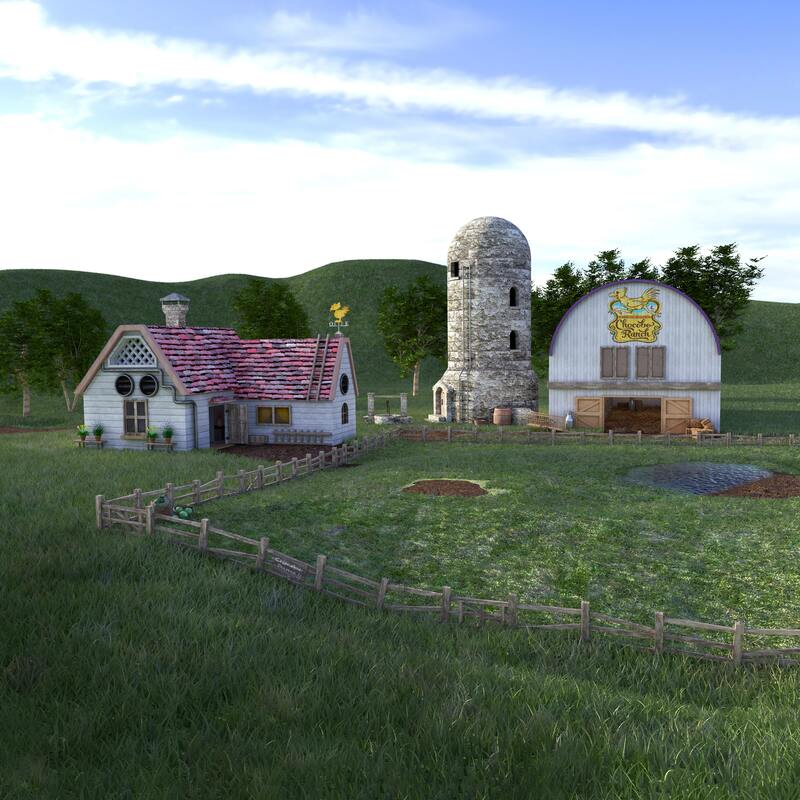 some progress on the chocobo farm. Playing with fur to make grass more realistic was fun xD. Ill try to add more props and finish by the weekend, then I´ll take holidays for 2 weeks xD. You really are doing some awesome work here! The scene has an almost identical feeling to the original area too, which is a difficult thing to replicate. I have a little critique, if thats ok. I don't want to deter you in any way at all, only give constructive criticism as I did before, please let me know if its not welcome or if I'm stepping on any toes. The grass, looks good, I like it a lot, really helps stop the area feeling so 'flat'. I think making the area inside the chocobo pen a little more 'worn' would make sense, as they're walking around on it all day. Regarding the roof of the house, the texture is a bit too tiling, it might be worth modelling just a few tiles yourself and placing them around to help create a bit less of a pattern, and also to make it look a bit less 'object with a texture on it'. The silo in the back is nice, but the texture tiles a lot, and especially on the sides, it can end up looking a bit flat. Outside of those minor things, this scene looks good, i wanted to ask if the sky is still temporary, I didn't see if it was mentioned above. Hey! Thanks for your comments guys!. No worries Dan Tsukasa, your point of view and criticism helps me to improve myself and to see if I missed something xD. I agree with what you say about the grass inside the chocobo area, I'll try to make it shorter than the outside area. The sky is the original one, but I can change it.About the silo and roofs I'll try to do something in post production, my computer is not a NASA computer xD and the rendering time for this one is about 16 hours . I'm planning to use a render farm service that will provide a massive improve in rendering times but there is only 5$ trial. Maybe I'll open a PayPal account to receive donations and top up the service when the trial money finish. I'll test how many renders I can do with 5$ and see what I'll do xD. I would gladly support you with some money. Send me a pm what you need to get started. Thank you, I really appreciate your support. I'll try with the 5$ trial and see how many renders I can do. It's not too expensive, 0'02$ per hour per core, so hopefully I could do a bunch of them with that money. Thanks again for all the support, I know the renders are not perfect but I'm trying to improve in every new scene and with your comments it's more easy to continue this project. Thanks Jusete to let us see your improvements!! And specially for your speed, you are letting us dream a bit... please send me a PM regarding donation! PS: regarding the last background, i think is great, just to adjust the color of the chocobo on top of the first house on left, is not visible like before! I'm ready to give my small financial contribution as well, of course! I'm learning 3ds max in my free time so, hopefully, I'll start to work with this program soon. The point to work with SketchUp is because it's faster and easier, you don't need to be worried about uw mapping and the final result is good. I still need to learn a lot about rendering settings, materials and all that stuff in SketchUp so will be better and better. I'll try to set up vray swarm (network rendering in vray) and hopefully the rendering time and workload on my computer will decrease. By the way, I tested the render farm tool yesterday and I spent 3.75$ using 6 cores(4 from my computer + 2 from the render farm) on a 2500*2500 pixels scene without textures and with the ambient occlusion activated. The render was done in 2:30h(with my laptop usually takes 8-10h so definitely it's worth it). This is used to add and have more control on the ambient occlusion in post-production. I'll try later with all the full textures and 10 cores+ and see how long it takes and how much it spends. I'll keep you posted. Generally we were using a 4x increase from the original size if i remember correctly. It wasnt a hard resolution since some scenes are designed to scroll while others arent. Renders with 4k displays in mind make the most sense imo, given how they are becoming the norm. edit: @sl1982 good point. Since not all backgrounds are the same aspect ratio, maybe target a certain PPI instead? The source has to fit without scrolling 320x240. But that's not the main problem of the images. The BGs have a very small color variety and were also made for the psx color system. This makes upscaling them so complicated. However new rendered BGs have a lot more information which results in better results when using an upscale technique, even though improvements would be minor. But I think the difference of an BG which was made for 4k or an image which was upscaled from 2k to 4k is also minor. And we shouldn't forget that Aali's driver has also a limit. Too much high resolution textures my lead to wrong displayed textures. The drivers maximum is 1024 MB ram, maybe it can be set higher, but Aali didn't recommended it and nobody has tested it. When the limit is reached then some textures aren't correctly displayed, usually the UI gets messed up. This looks great man, glad to see you're still at it. I can see improvement overall, great work! Sadly I can't offer much help, I do all of my rendering either in UE4 or Marmoset and am unfamiliar with the tools you're using. Your materials looks great, but as some of mentioned, adding some diversity to the tiling will help. Such as skewed roof shingles and such. The only thing that really grabs my attention is the shingles on the house, the ones on the front don't meet up with the sides. It's a hard area to gauge since it's so small. Otherwise it looks great, the sign on the barn is just beautiful. When the FF7 scenes are completed you should definitely look into building environments in UE4, particularly if you're modeling modularly. Hey cmh175, nice to see you around xD. I'll do something with the shingles in post production with Photoshop. 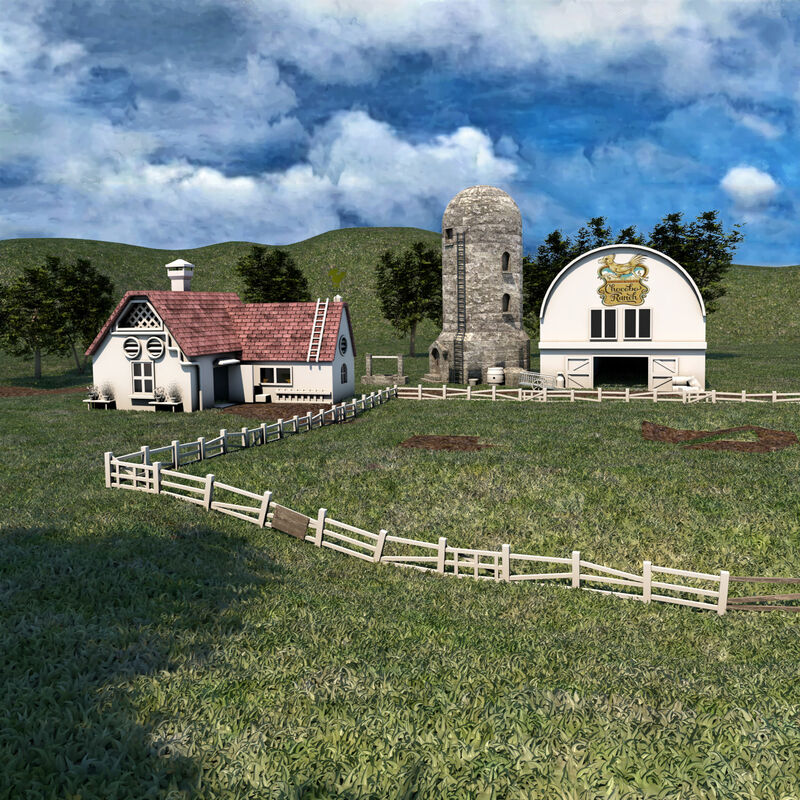 The grass is now looking great and I've changed the lighting and now is more realistic. on the other hand, I've used the 5$ trial plus 4$ more to render this background so any donations will be welcome. I'll update the first post with all the finished pics and links to download them and with the link to the donation page. Thank you for all your tips, your comments and support! Nice, Grimmy is one of the best in ff7 modding so I´m happy to have him in. I´ve updated the first post with all the pics and links to download the backgrounds xD. I´ve changed the shingles and increase a little bit the bump and displacement effect. The grass from inside the fences is shorter than the one outside to make a grass tread effect. Some sacks with chocobo greens, mud and a puddel inside the fences as weell and some chaff inside the barn. Hope you like it guys xD.